The 2017 MTV Video Music Awards were held in Los Angeles on Sunday, and the most fashionable stars wore bold colors, graphic prints and sheer (very sheer) metallic pieces on the red carpet. Because it’s better to show off incredible physiques, designer underwear and oodles of sparkling jewelry, of course. Nicki Minaj attends the 2017 MTV Video Music Awards at The Forum on Aug. 27 in Inglewood, California. 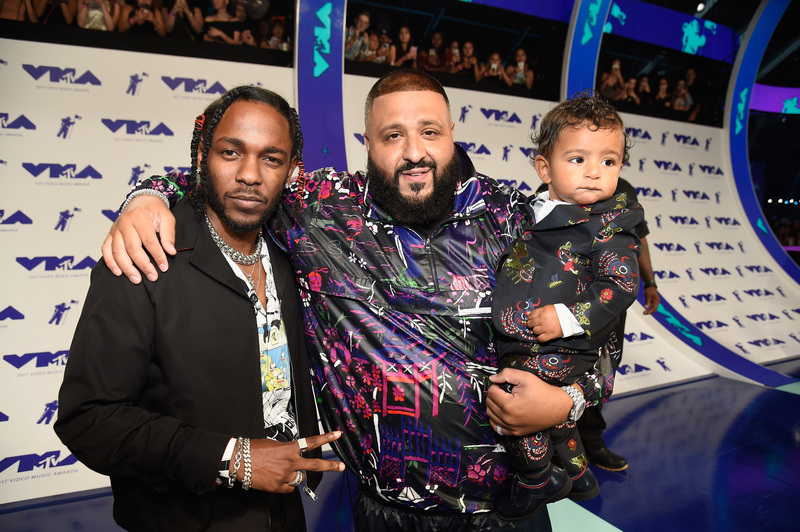 Kendrick Lamar (left) and DJ Khaled with his son, Asahd, attend the 2017 MTV Video Music Awards on Aug. 27 at The Forum in Inglewood, California. Kendrick Lamar, who was up for eight awards, including video and artist of the year, wore a black coat and trousers by Prada, and bright white Nike Cortez sneakers. The DNA and Humble rapper shared a turn on the red carpet with DJ Khaled and his mini-me son, Asahd, whose baby dragon suit won the night. Tiffany Haddish attends the 2017 MTV Video Music Awards at The Forum on Aug. 27 in Inglewood, California. Tiffany Haddish, the breakout star of the summer’s biggest movie, Girls Trip, rocked a sheer silver minidress and sandals. Young M.A attends the 2017 MTV Video Music Awards at The Forum on Aug. 27 in Inglewood, California. 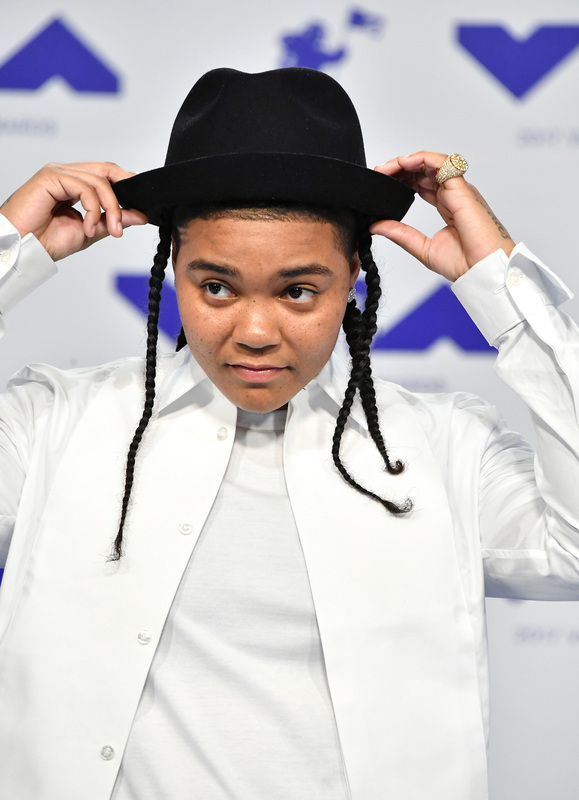 Brooklyn, New York, rapper Young M.A kept things extra clean and simple with a white-over-white shirt and jacket. Jay Versace attends the 2017 MTV Video Music Awards at The Forum on Aug. 27 in Inglewood, California. Jay Versace, the hilarious social media star (his Instagram page has 2.3 million followers), brought his best prep nerd to the MTV party. 21 Savage (left) and Amber Rose attend the 2017 MTV Video Music Awards at The Forum on Aug. 27 in Inglewood, California. Glamour puss Amber Rose was nearly unrecognizable in a long brown-and-red wig and sheer Yousef Aljasmi gown. Her latest beau, Atlanta rapper 21 Savage, wore a skinny white suit (sans shirt) and lace-up oxfords. 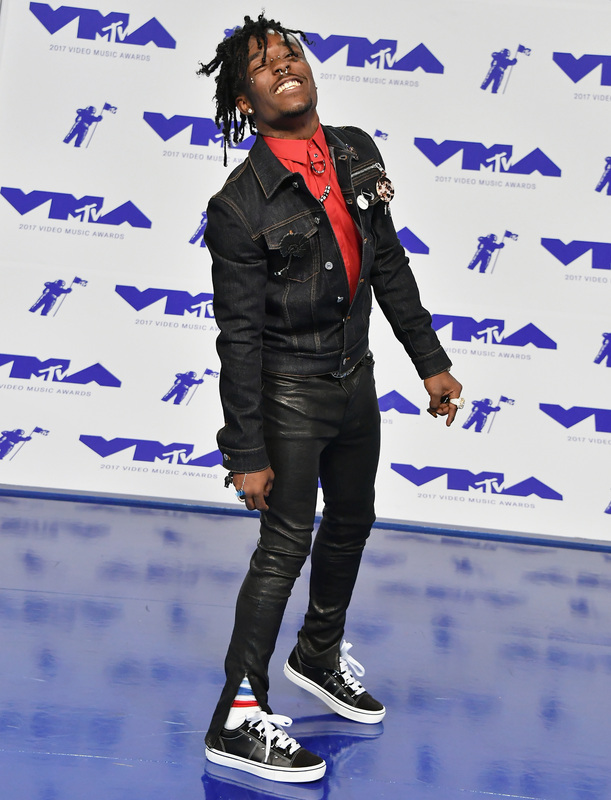 Lil Uzi Vert attends the 2017 MTV Video Music Awards at The Forum on Aug. 27 in Inglewood, California. Katy Perry attends the 2017 MTV Video Music Awards at The Forum on Aug. 27 in Inglewood, California. Katy Perry wore a fitted Stephane Rolland gown and spherical gold earrings before opening the show wearing a space suit. Yara Shahidi attends the 2017 MTV Video Music Awards at The Forum on Aug. 27 in Inglewood, California. black-ish star Yara Shahidi wore a bronze one-shoulder gown by Zimmerman, Giuseppe Zanotti shoes and earrings by Porcelain Chyna. Khalid attends the 2017 MTV Video Music Awards at The Forum on Aug. 27 in Inglewood, California. 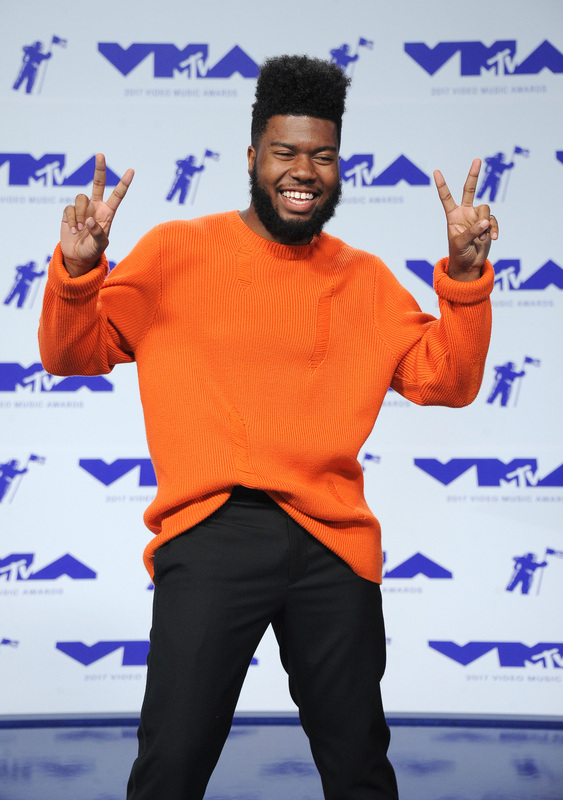 A high-fashion enthusiast and best new artist nominee (for his album American Teen), rapper Khalid kept it casual in an orange sweater and black pants. Kyle attends the 2017 MTV Video Music Awards at The Forum on Aug. 27 in Inglewood, California. 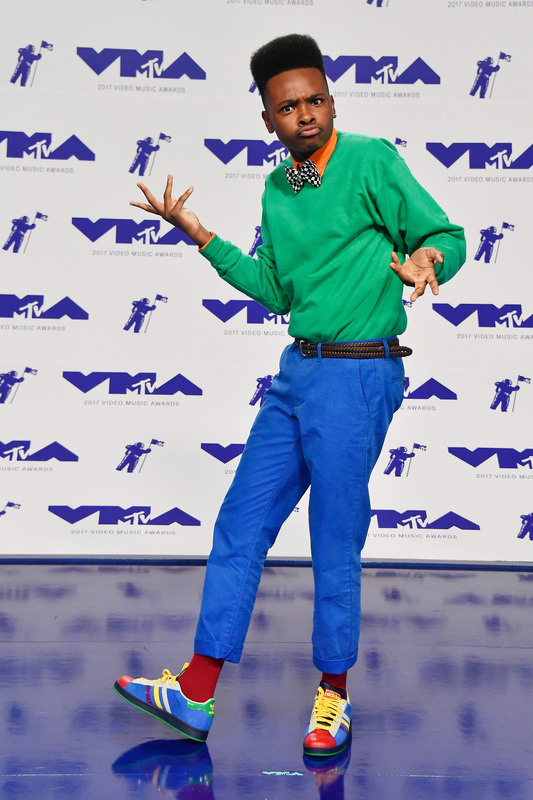 Twenty four-year-old Ventura, California, rapper Kyle brought out a slick gold suit for his first turn at the VMAs. Cardi B attends the 2017 MTV Video Music Awards at The Forum on Aug. 27 in Inglewood, California. 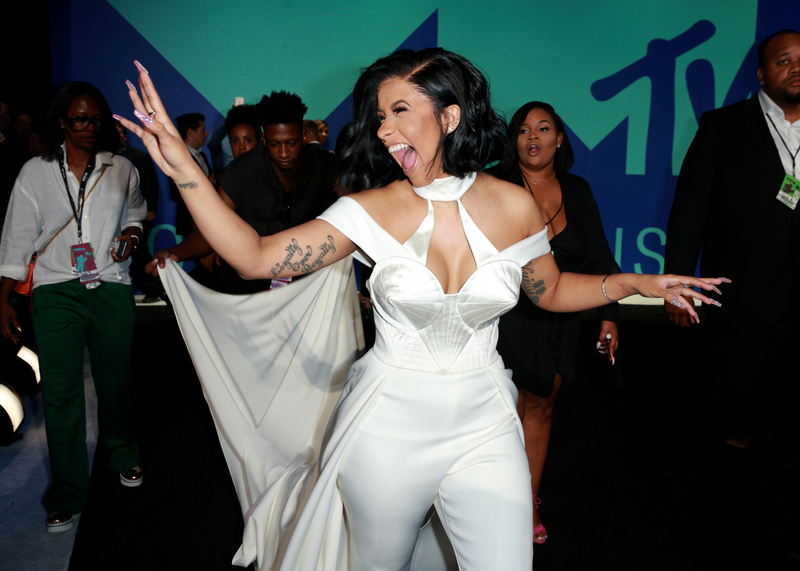 The Bronx, New York-born Love & Hip Hop star-turned-pop star Cardi B wore a white silk pantsuit with a train — and a bodice reminiscent of Madonna’s iconic Blonde Ambition pink cone bra — for the red carpet after performing her hit song, “Bodak Yellow,” during the pre-show. Cardi B, whose bold song has stolen the summer, voiced support for former San Francisco 49ers quarterback Colin Kaepernick, who is currently unemployed after protesting the national anthem during the 2016-17 season.